For the first weekend in November, Tara and I traveled a slow and snowy I-70 out to Utah for some warm days in the desert. 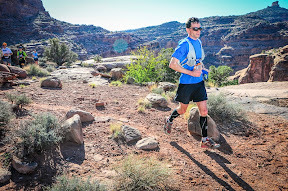 Our main goal was Saturday’s Moab Trail Marathon, of which I was facing up to my actual fitness level and moving to the half marathon course and Tara would be running the 5k for the 3rd year straight. I hadn’t run much for the week before the race, so my body should have been well rested, but I wasn’t feeling super strong going into the event. My “A” goal was to have a fun and enjoyable race. So I guess it was good that I started in wave 3 of 5 and spent the first 4 uphill miles jogging well within my comfort zone, passing other runners who went out way too fast and generally settling in to my form and pace. Full race GPS track right here. Toward the later half of the Pritchett Canyon climb I started to pass more and more runners, especially on some of the steeper scrambling sections of rock. For the slight downhill into the first aid station from miles 4-5.5 I took it easy and ran with one or two others and chatted. A quick swig of sports drink and I started semi-hard on the rolling terrain that followed, passing quite a few runners, including one sporting a I believe in The Blerch tee. Sometime between miles 6-9 I got frustrated with the number of runners I was having to pass on semi-technical trails until I remembered that I was the main problem, starting in wave 3 (which may have made sense for a half-marathon effort, but didn’t for my quicker half pace). I will say this course is beautiful, but technical enough that I didn’t get to look around and enjoy the scenery. Coming into the 9.6 mile aid station I ran into Chris and Brad who were out looking for me and found themselves helping an injured runner descend some steep cliff bands. With their cheering I took another hit of sports drink, then turned right on the half course for a bit of a road climb that I ran semi-hard. Our next bit of trail had us passing some mountain bikers (on a technical downhill that they were walking their bikes), then in and out of the Kane Creek (cold and mid-thigh deep in spots on me). With only a couple miles to go I was getting into full competition mode, the constant passing of other runners fueling my speed. The creek definitely slowed everyone down (it’s hard running on completely numb feet! ), but as we moved out of the creek for the final road and last trail sections I started to push my pace even faster. I also got a little spiteful, picking out runners ahead and passing them for minor reasons (“he’s wearing tights, can’t let him beat me”, “that guy with the hipster ‘stash is getting passed”). Not entirely proud of this behavior, or the two ladies who I sprinted past in the last 50 meters, but the 2:13:16 time felt good for this technical and hilly of a course. 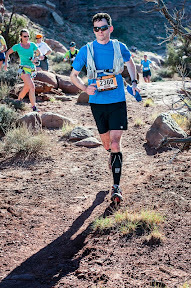 This was also the US Trail Half Marathon National Championship, which I guess means my 138th place finish sorta means I’m the 138th best trail half marathoner in the country (if you can believe that). Full results right here. Other than the cold creek crossings, this was a wonderful course. I’d certainly consider heading back next year and seeing if I can’t compete at the full marathon distance.